East Haven, Connecticut - Saturday, November 3, 2018: #1 Cheshire H.S. vs. #2 Amity H.S. during the first game of the SCC Girls Volleyball "Championship Final Saturday at East Haven H.S. 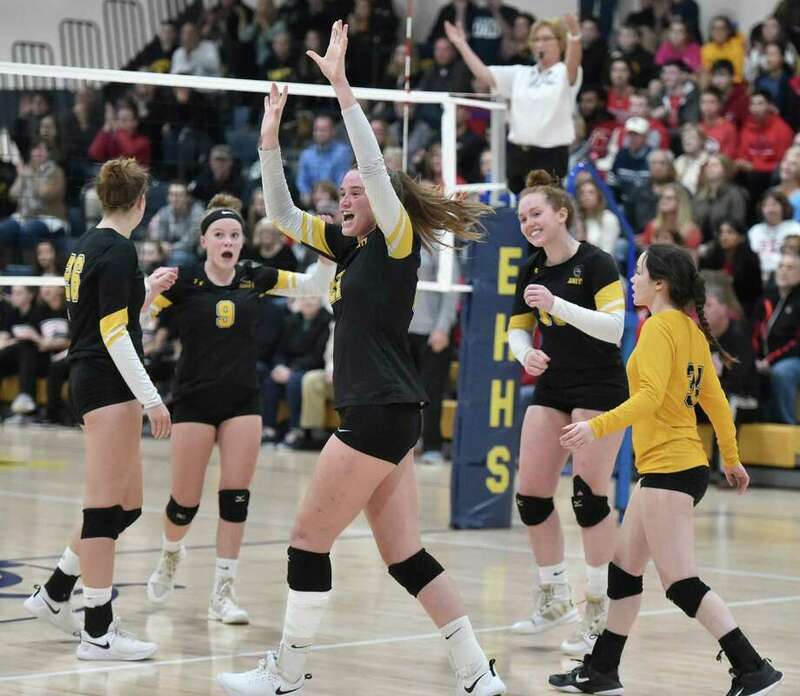 EAST HAVEN — Between the Cheshire and Amity volleyball teams, they owned 17 Southern Connecticut Conference tournament titles and shared another. It was only fitting the premier teams of the conference met again Saturday evening to decide another league title. Behind the play of Cheshire’s defense and a stirring comeback, the Rams rallied from a 2-0 deficit and took home their 12th SCC tournament title. In the process, Cheshire remained undefeated on the year (21-0) and evened the finals series with Amity (4-4-1) with a 22-25, 21-25, 25-20, 25-21, 15-12 victory at East Haven High. Looking to win its third SCC title in four years, third-seeded Amity could not close the deal. Instead, the top-seeded Rams stormed back to win their second consecutive league title. Behing the play of Lindsey Abramson (15 kills, 14 digs) and the defensive play of tournament Most Outstanding Player Ariana Perlini (18 digs), the Rams were not to be denied. Cheshire rallied from deficits in each of the final three games, including the fifth game where it trailed 3-1 after an ace by Amity’s Madeline Adzigian. With the final game even at seven, a block by Meagan Clyne and a kill by Jenny Wang gave the Rams a 9-7 lead.. Cheshire never looked back as kills by Wang and Clyne extended the margin to 11-8, before another kill by Abramson had Cheshire within two points of its second consecutive league title. Trailing 2-1, the Rams did not give Amity a shot in the fourth game, jumping out to an early lead and never looking back. As has been the case all year, Cheshire’s ability to keep the ball off the floor prevailed as any long rally in the game went to the Rams. Emily Russolillo gave the Rams a 19-12 advantage, before a kill by Amity’s Abby Harbinson got the Spartans within 22-16. The Rams finished off the game with its strong defensive play, behind Perlini. With the thought of an undefeated season slipping away, Cheshire responded by rallying to win the third game. After the Spartans came back to even the game at 11, the Rams then turned the game around. Abramson was the key from the service line, leading the Rams to six straight points and a 19-13 advantage. Cheshire’s Emily Russolillo and Mia Juodaitis gave the Rams a bit of breathing room with kills in the rally, before Cheshire controlled play at the net to finish the game. The second game was a battle as each team had its runs. When it counted most, the Spartans ran off the most impressive rally with six consecutive points to take a 23-17 advantage. Junior Lauren Walsh was the key at the service line for Amity, allowing the Spartans to pull away with a pair of aces. The Rams also hurt themselves with three errors in the run, before a kill by Clyne gave Cheshire hope at 23-19. The Spartans (16-6) took the first game by three points after a back and forth battle. After the Rams built an 18-11 lead in the opening game, Amity rallied back with seven consecutive points to even the game at 18. Three kills by Harbinson, and two kills by Caroline Fertman helped tie the opener. A kill by Cheshire’s Abramson evened the game at 22, before a pair of Cheshire errors and a kill by Amity’s Adzigian allowed Amity to take home the opener. Julia Bartlet added 11 kills, four blocks and three aces for Cheshire, while Emma Watkinson ran the offense with 38 assists. Harbinson led Amity with 18 kills, while Adzigian had five kills, and Zoe DiZenzo ran the offense with 39 assists. Olivia Pisano led the Amity defense with 12 digs. Ariana Perlini — The Cheshire junior was the key to the turnaround, as her defense led the way with 18 digs. — Cheshire coach Sue Bavone on playing Amity. Records: Amity 16-6, Cheshire 21-0. Highlights: A—Abby Harbinson had 18 kills. Madeline Adzigian had five kills. Zoe DiZenzo had 39 assists. C—Lindsey Abramson had 15 kills and 14 digs. Ariana Perlini had 18 digs. Julia Bartlet had 11 kills, four blocks and three aces.